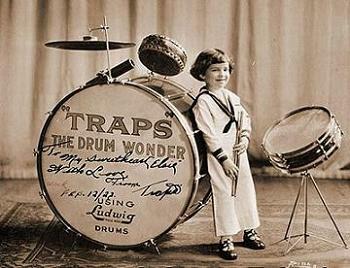 The first clamps ("clips") and fasteners appear in the 1920s, with the commercialization and standardization of the first drumsets (first picture of a modern drumset in 1918 Ludwig catalog), to suspend small instruments (bells, wood-block, Chinese tom-tom, small instruments which did not require thick fasteners ( Photo: Buddy Rich in a drum solo show in 1922, at 5 years old!)). 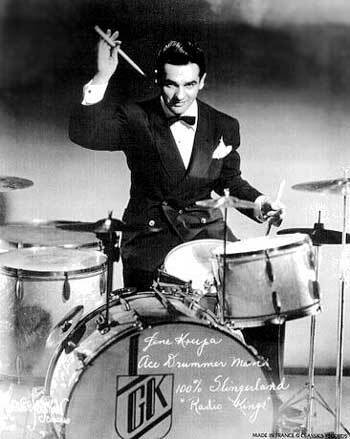 It came also quickly the idea to fasten a rod to bass drum to hang a cymbal, the "first signs" of the ride (which actually appears with Kenny Clarke , at the time of Be-bop in the 1950s). The idea of fastening toms in the bass drum shell appears only with rock'n roll and pop music (with amplified instruments that require a powerful hitting of drummer and fasteners accordingly) in the years 1950 (before the middle tom was fastened to the bass drum hoop or with an individual stand, making it difficult to extend in height above the bass drum, making them away and difficult for the passages (see photo of Gene Krupa above, in 1946)). 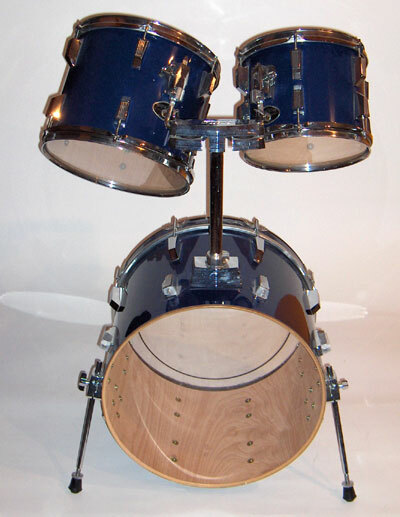 There are several fastening toms systems, which penetrate into the bass drum. The most archaic and least reliable and interesting for the sound (it reduces vibrations) is a low-end system with "L" tubes (one per tom), which penetrate directly into the toms. This system has the drawback to get too easily loose when you hit the toms. A more recent and convincing in my opinion, proposes to enter an "L" rod in an extra shell ("tom bracket") screwed on the shell of tom (more stable and less alters the sound). First with a notched disc to adjust the tom tilt finds its true fulfillment (for me) with the ball joint socketed in a jaw, which allows all positions and a quick and reliable tightening. The addition of "memory locks" screwed by a square key (such as tension bolts) at various levels of the tubes (above the bass drum and under toms mounting brackets), to prevent slides and loose, is also a considerable recent progress (and I believe essential: it avoids to re adjust your instruments every 5 minutes (just once every 6 months with this system, the vibrations inevitably leading to a slight loosening)). Finally, the latest innovation proposes to place the tom bracket on the tom tension hoop or fastened to tension rods, which alters even less the resonance of the shell. 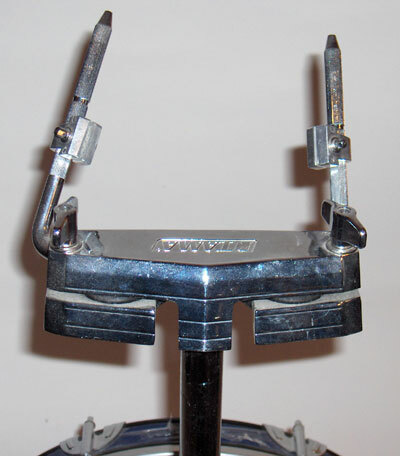 The "clamps" are fasteners with wingnut which are fastened to a tube (of a rack, cymbal stand or tom holder). 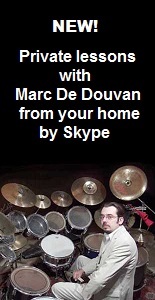 They can simply connect two elements (double clamp) or present an extension to hang a cymbal, a bell or a tom. 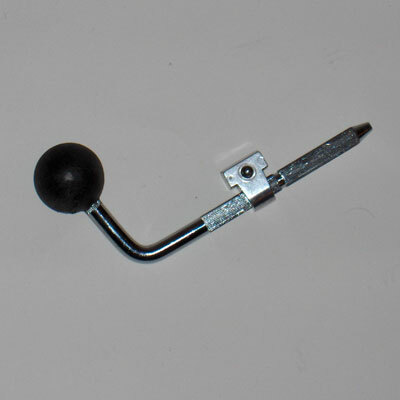 The bell stands consist of a solid and thin "L" rod (as the toms, but beware, the diameter does not always correspond to all brands of bell) and a clamp with rotation. You can fasten bells, wood blocks, tambourines designed for this purpose (with fastener with wing screw). 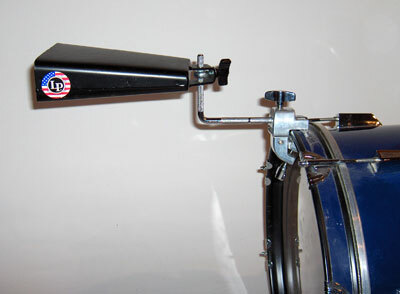 There are bell stands (or "holders") with jaw to fix them to the bass drum "rim" (hoop). Finally, there are adapters for cowbell and agogo not equipped with fastener wing screw, in order to fasten them to bell stands. 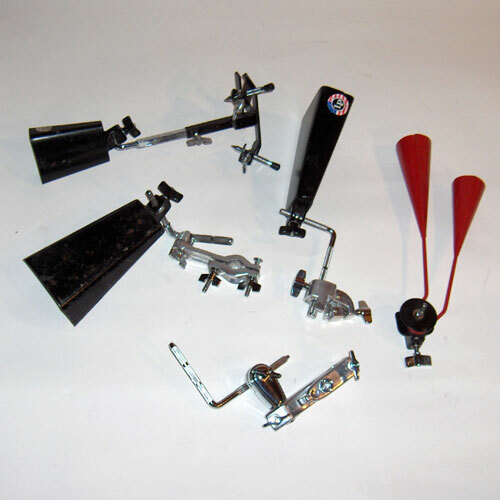 In fact, today, all percussion instruments can be suspended in a drum kit (set), with all these extensions (find out from a specialized dealer). You have even alligator clips for individual microphone that fasten to the drum hoop or a tube.